These wheels are awesome! I put them on my grizzly 700 and it totally changed the look of this arc. Shipping was fast. I had them in two days! I will definitely buy from pureoffroad from now on. These wheels look good. I went with the wide offset and it seems to add some additional stability to the Rhino. I bought these along with Interco Reptile tires for my '13 Foreman, and couldn't be happier. Shipping was FAST and the quality is top notch! The black rims look amazing. First time purchasing a gloss black wheel, we ride mostly water and creeks, so the sand has taken some of the gloss off in just a couple of rides. 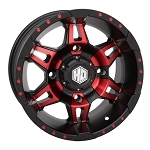 But Pure OFFroad has great shipping as well as pricing. 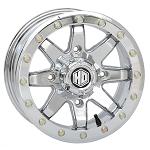 Q: Does rims orders come with lug nuts and valve stems ? A: Yes we include valve stems and lug nuts with all of our rims. 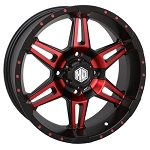 Q: will these rims fit my 2015 sportsman etx stock wheels? A: Yes they will fit your model and your stock tires.